It gives me an immense pleasure to hand over to you one of the best pumpset product range available in market today. 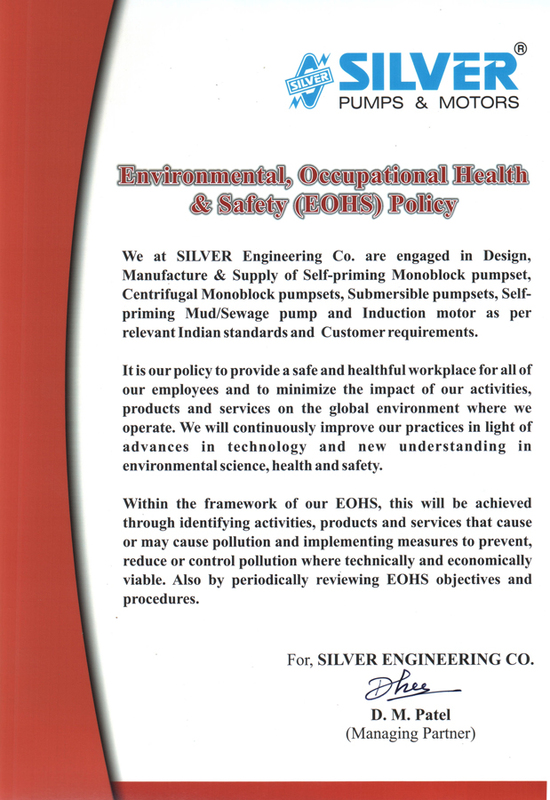 Silver Engineering Co. is striving hard with fullest of dedication, Since 1981 to continuously improve the product quality & range as per the customers requirement. We have always aimed for the customer satisfaction in terms of product performance and giving full valve to his money. 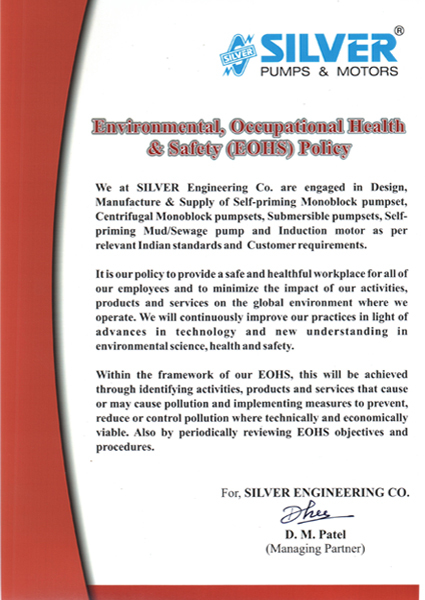 Simultaneously we, at silver Engineering Co. have always valued to the culture & the basic ethics of business which has given us the strength in our journey till date & will be doing so in long future ahead. We always have collabrated with our customers and associates with a long term view, ensuring mutual growth & prosperity. We have always used the best & modern facilities available. Our achievement of ISO-9001 aprovals are a part of it. We today assure to further anhance our effective support to you with newer technologies and modern process infrastructure & world class practices. Silver product have always stood up to the customer demands, may it be of higher discharges, low voltage workings or that of variety needs of selection. This surly is an out come of your constant support to us. We are handing over this new improved & up dated catalogus to you which will help you serve your customer in a more better way. Thank you for your co-operation & support all these years. Wish you all the success in your business & personal life in future. 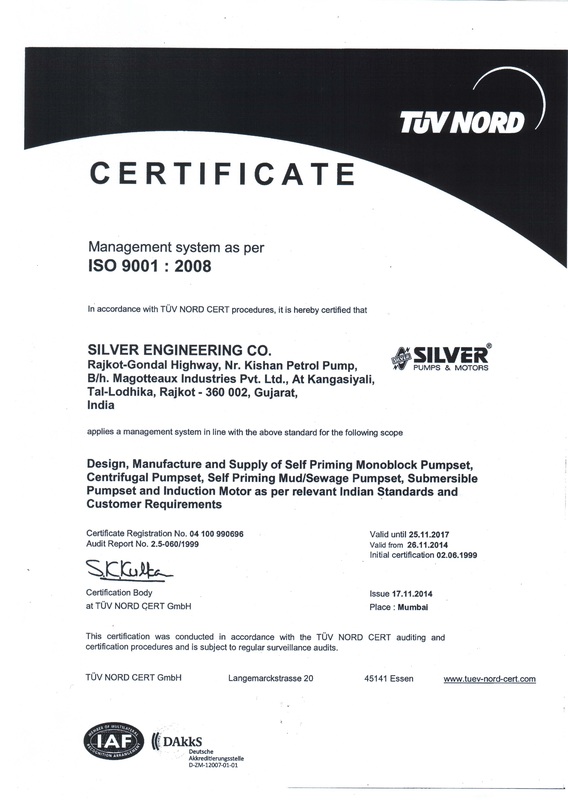 Silver is established in 1981 as a supplier of Self priming pumps, Centrifugal Pumps, Openwell submersible Pumps, Borewell submersible Pumps and Mud/Sewage Pumps. Our goal is provide best qualitative Pumps and win their feedback as life long business relation. Our customer satisfaction is always on our priority list. We Have Our Own In House Manufacturing, Sourcing and Quality Control Facility with World Class Equipments, Gadgets And Instruments. Today, under the creative instincts, aggressive marketing techniques, visionary approach and ambitious nature of our director, we have made rapid strides and have acquired a respectable status. A team of dynamic professionals continues to innovate in ways that best serve our customer's interest. We look forward to adding you to our family of customers. Winners of Udyog Pratibha Ratna & Rashtra Nirman Ratna Awards. Wide range & multiple models for selection to suite customer needs. Product for low voltage working. Production Capacity of monthly more than 20000 units. Most modern set up with automatic winding m/c, CNC machines & Welding Robot. R & D set up for new products development.